I thought I knew everything about raising kids, having performed those duties for a long, long time. However, as the old saying goes, you learn something new every day. Until I read Cookies for Dinner, I can tell you with absolute certainty that I did not know that vomit is the strongest hairstyling product on the market or the poop capacity of the average car seat. Did you? I received a gift-wrapped, Advance Review Copy of this book from the authors, complete with business cards, cute bookmarks and a package of yummy cookies! It has since been published and is available from your favorite bookseller. Cookies for Dinner is actually a series of essays, showcasing the joys and pitfalls of motherhood from the perspective of two good friends, but two very different women. You have Pam, the dedicated career woman, who came to motherhood later in life via adoption. And then you have Kae, the accountant, who followed society’s norm by marrying young and starting her family early, only to discover her husband was cheating on her while she was pregnant with her first child. 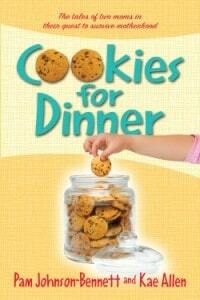 Each co-author brings her unique parenting style and “adventures” to Cookies for Dinner. And although each gal is an entertaining author in her own right, together they are unstoppable. Each and every essay in this book is warm and very, very personal, shot through with a heavy dose of humor. Come on, how did you get through “those” years? If you didn’t laugh about it, you panicked and/or cried until your mascara ran into your socks. Pam and Kae are no different, except that they’re willing to tell the world about all of those embarrassing moments that only little kids can so dramatically create. If you’re a seasoned mom who wants to relive the early days, this book is for you. If you’re a new mom and don’t know quite what’s coming around the next corner, this book is for you, too. And if you just like kid stories that will literally make you laugh out loud, make sure to pick up a copy for yourself. If humor is indeed the best medicine, Cookies for Dinner is definitely a cure for what ails you!